The first printed book of Dead Winter! One hundred fifty pages printed on brilliant 80# Matte stock at a sizeable 12x7x0.35 inches! Contains chapters 1 through 4, pages 1 to 138 of the comic plus ten pages of bonus content. All strips have undergone artistic refinement, fixing vlaue contrast, proportion and expression issues present in the online pages. This is one of the handsomest softcover print volumes you can find anywhere online! 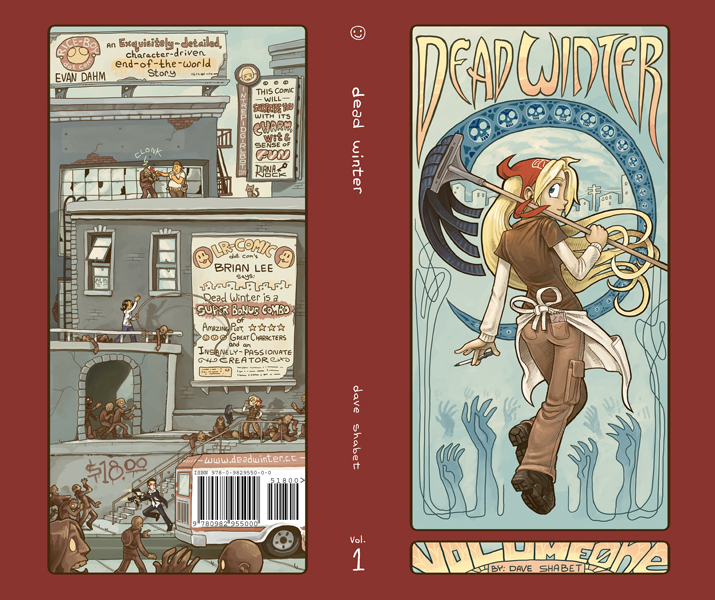 The second printed book of Dead Winter! One hundred fifty two pages printed on sparkling 80# Matte stock at a hefty 12x7x0.35 inches! Contains chapters 5 through 8, pages 139 to 277 of the comic plus ten pages of bonus content. All strips have undergone artistic refinement, fixing vlaue contrast, proportion and expression issues present in the online pages. 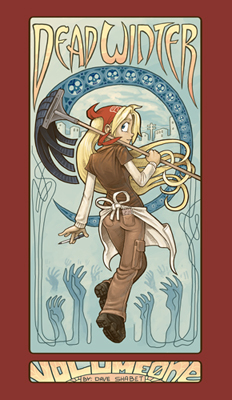 This is also one of the handsomest softcover print volumes you can find anywhere online! These are eBook versions of the printed volumes of Dead Winter, both one and two. They contain the same content as the print versions with full 300dpi high-res art files. Ebooks are sold through Gumroad.com, this purchase will click through to another site. All the fun of semi-posable figurines with the added joy of painstakingly assembling it yourself! These papercraft projects were hand-designed and engineered from scratch by the artist and come with metal foot weights and free printed instructions for both Lizzie and Monday. This is a light-weight item, so it has a special reduced shipping charge. As above, but includes both projects at one flat shipping cost. The most fun six or so hours of cutting and assembling you can find anywhere, guaranteed!